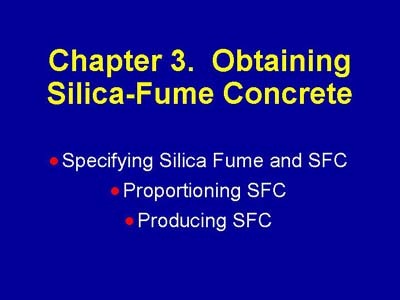 This chapter of the presentation describes how to obtain silica fume and silica-fume concrete. Specifications for silica fume and silica-fume concrete are described. Then, mixture proportioning to obtain specific concrete performance is described. Finally, production of silica-fume concrete is presented.